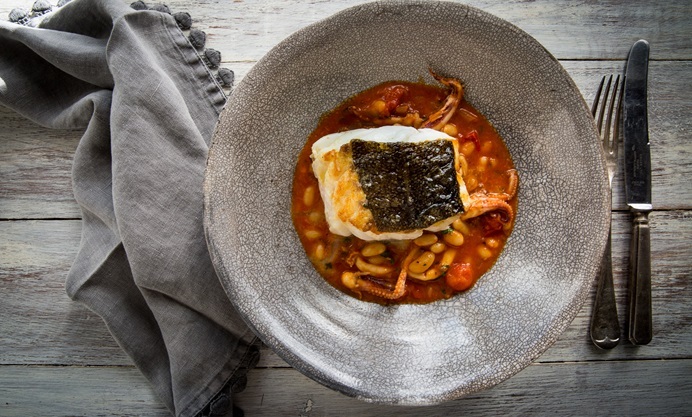 Louise Robinson serves up buttery cannellini beans with braised squid and pan-fried Skrei – a sustainable cod from the Barents Sea. 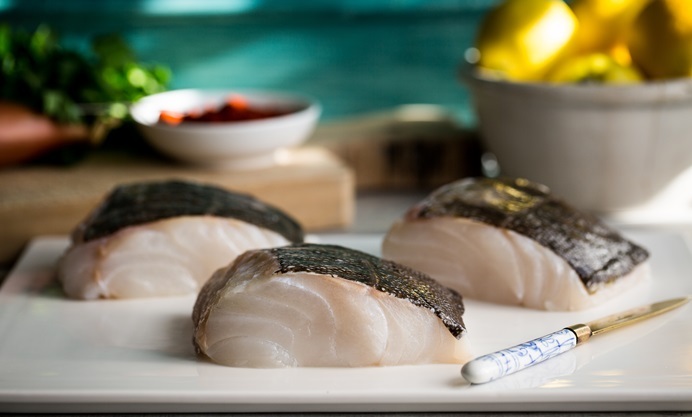 Considered a Norwegian delicacy, Skrei is only in season between January and April. 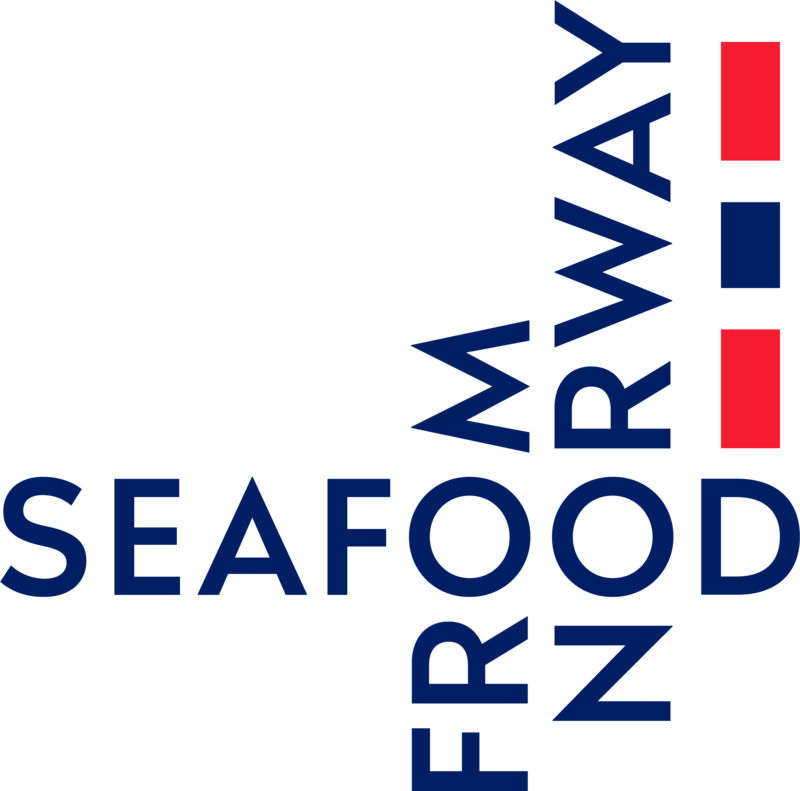 We recently visited the fishermen of Tromsø with some of the UK's top chefs to learn more about Skrei. If you have never heard of Skrei you would be forgiven. Until a couple of weeks ago I had never heard of it either. Skrei, pronounced ‘skray’, is the name of a migratory Norwegian cod so special that it must be Norway’s best kept secret. Every winter something remarkable happens, when driven by instinct great multitudes of cod return from the Barents Sea to their original spawning grounds around the islands of Vesterålen and Lofoten. Their epic 1000km swim through turbulent Arctic waters give the Skrei their sublime succulent white flesh. I do not say this lightly, but this is without doubt some of the best fish I have ever tasted. It is as far removed from ordinary cod as it could possibly be, and the pristine white fillets have an incredible texture and flavour. Simply pan-fried or steamed en papillote, the flesh comes apart in thick meaty flakes. I have come up with an uncomplicated dinner party dish that I think is worthy of this wonderful fish. 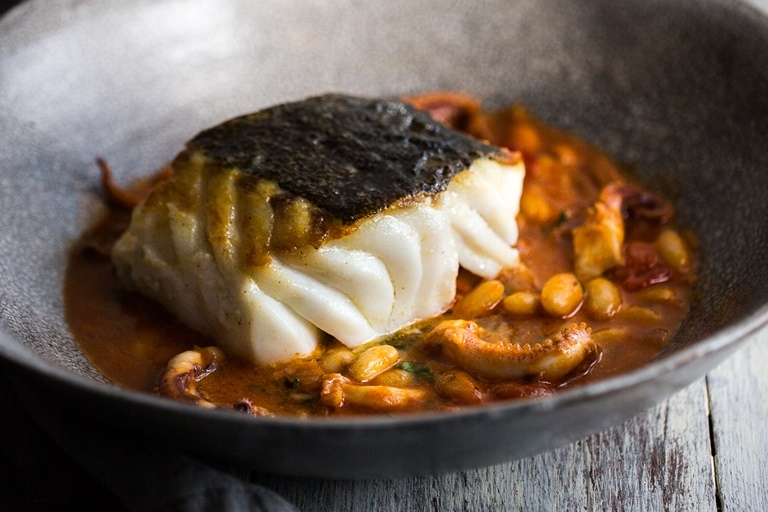 Lightly pan-fried Skrei loin fillet, served on a bed of cannellini beans and tender squid braised with smoked paprika, tomato and white wine. I like to use dried cannellini beans as I prefer their texture and flavour, but you could use canned cannellini beans instead – just simmer them gently in the stock for 10 minutes instead of an hour if you do.